I dutifully took out my notebook, etching the bull’s hide of Spain and marking the end of the pilgrimmage across the top of Spain with a star. As Raquel recounted her experience walking a month across age-old trails between drags on a cigarette, I’d been imagining a return to Spain one day to walk the Way to Santiago de Compostela. 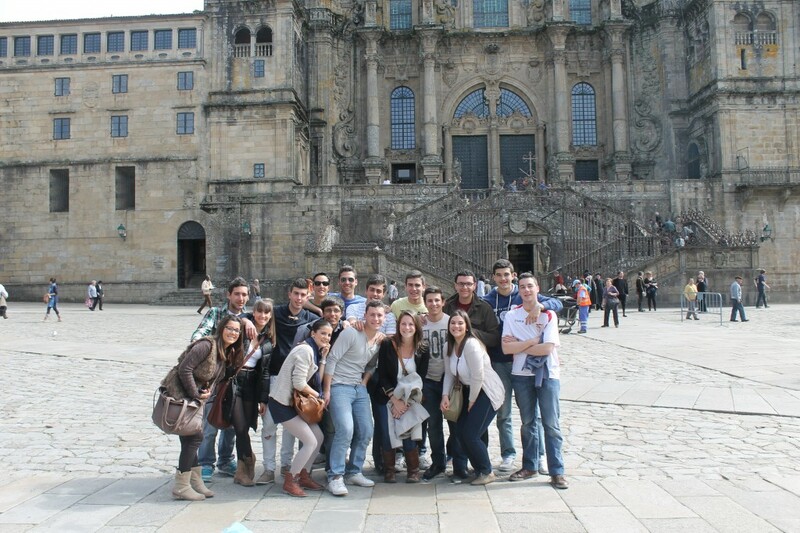 During my 2012 trip, I ran into some of my old students from IES Heliche. All roads may lead to Rome, but quite a few lead to Santiago, too! 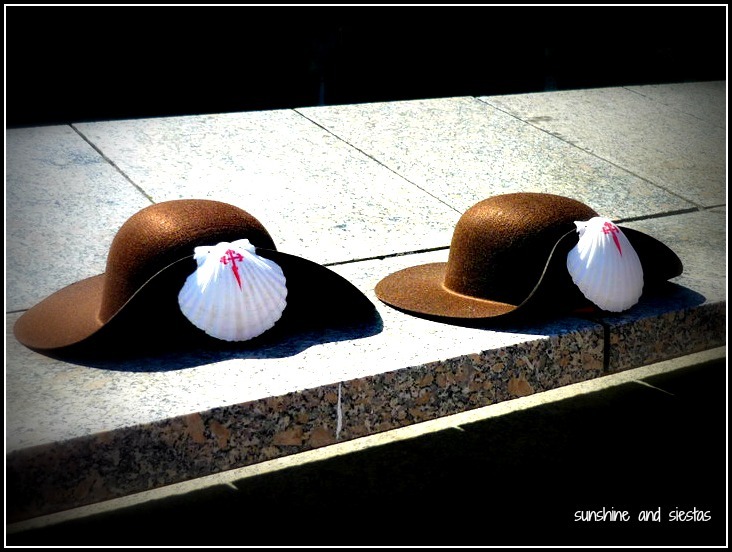 Galicia, the region in which Santiago is located, is like my second home in Spain. 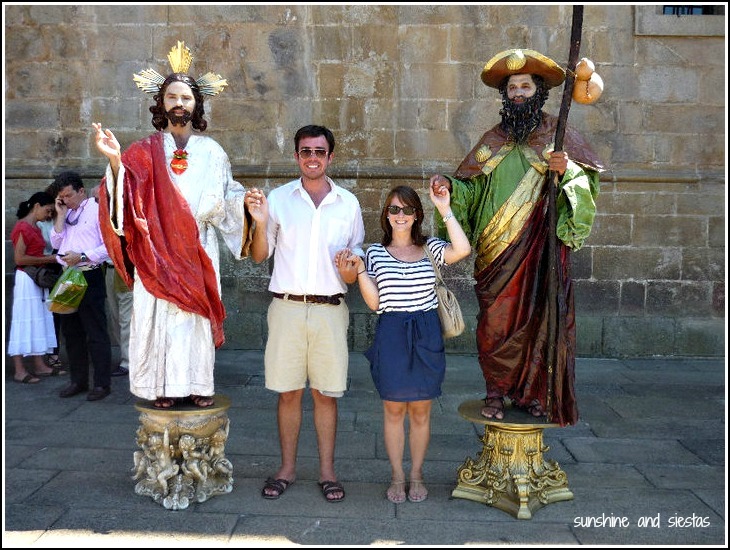 On half a dozen occasions, I’ve laid my eyes on its sprawling cathedral, watched backpackers with no common language embrace in the sacred Plaza do Obradoiro, smelt the mix of incense and sweat left by peregrinos as I’ve hugged the bejeweled bust of St. James, the patron saint of Spain. I’ve even spent the Xacobeo, the Holy Years in which St. James’s Day falls on a Sunday, partying until dawn in the sacred city. The Camino has been part of my Spain bucket list since that sweltering day in June when Raquel first talked about it. While many legends exist about its origins, perhaps the most common story is the one in which St. James, one of Jesus’s disciples, had his remains placed in a boat from Jerusalem. The saint was covered in conch shells and barnacles when his boat washed up on the northwest coast of Spain, and the remains were subsequently buried. Centuries later, a shepherd claims to have seen a cluster of stars in a field at night over the reputed tomb of the saint, and King Alfonso II ordered a massive cathedral to be built in that very place. For the last milenia, hundreds of thousands of pilgrims have descended on the city – now a major tourist draw and intellectual center – believing that completing at least the last 100 kilometers on foot brings pleneray indulgence. This route is called la Ruta Xacobea in local galego, or the Camino de Santiago in Castellano. To me, its one name, El Camino, holds a world of meaning. The Camino is the subject of numerous books and films, and ever since its first inference, I’ve read many of them. Paulo Coehlo’s The Pilgrammage, Field of Stars by Kevin Codd, A Journey of Days by Guy Thatcher all stick out in my mind, and a flight home from Spain in 2011 had me watching Emilio Estevez’s poignant film, The Way. After years of wishing, planning and reading loads of books on the Camino, I’ve finally made plans to go. My hiking boots and trail bag are purchased, our route has been carefully outlined in red from Gijón to Santiago de Compostela. Towards the end of July, Hayley and I will set out from Asturias, rumbo Santiago. The Northern Route, called the Ruta del Norte, is less-traveled, more physically straining and supposedly breathtaking, as the majority of our first week will be along the coast before taking the Primitivo route until we reach the end of our trek. People walk for many reasons – for spiritual reasons, for a journey of self-discovery, for the sport and adventure of it all. But I’m not walking just for me and a goal eight years in the making. I’ve decided to walk two weeks on the Camino de Santiago For the Kids – to raise money for the University of Iowa Hospitals and Clinics, an organization that has been important to me for nearly ten years. As a college student, I would only pull an all-nighter once a year, during the annual Dance Marathon. During a full day, I could not sleep, sit or drink alcohol, an this was after raising a minimum of $425 to even get in the door. For an entire day, we’d put our bodies through hell to feel some sort of what kids and their families felt. Coupled with bi-weekly visits to the hospital’s Child Life center and numerous leadership positions, I was hooked on helping and creating tomorrow by dancing today. When I became a Morale Captain in 2005, I was assigned a family to sponsor. The Lees were coping with Kelsey’s recent diagnosis of leukemia, a side effect of the chemo she’d received earlier in the year. 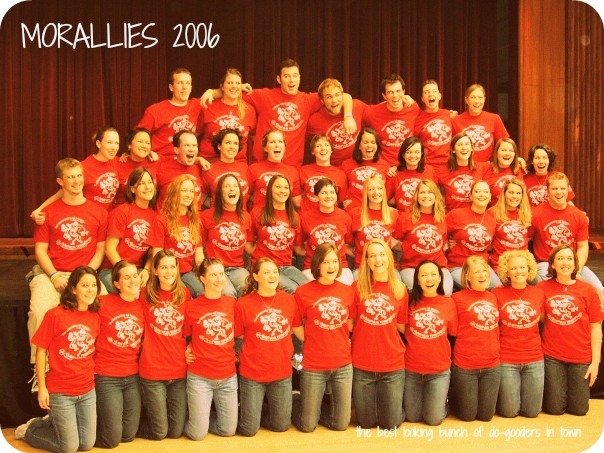 We began to exchange emails and phone calls, excited to meet one another at the Big Event in February, 2006. Kelsey was only 14 years old and already fighting cancer for the second time. After repping the Lees for two years, she was passed onto another sorority sister, but stayed in the family – literally – a sister from two pledge classes above me’s father married into Kelsey’s. Even when I moved across the charca, we kept in touch through Facebook, postcards and Skype. Invitations for her high school and technical graduation got sent to my parents’s house, along with a yearly Luau-themed fundraiser her family held in their town. 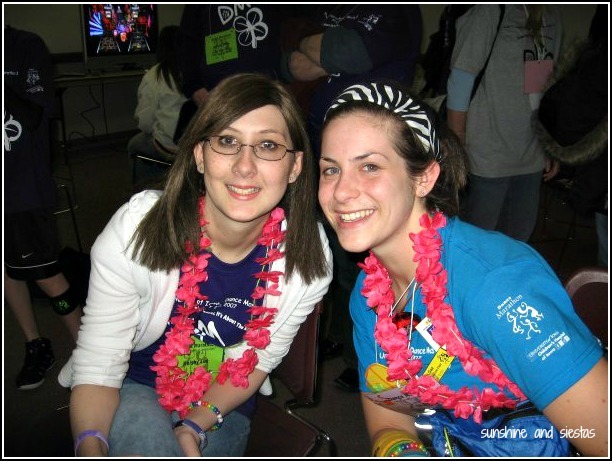 Kelsey felt like a cousin to me, so I was crushed when I learned she’d relapsed once again. “You’re so much braver than anyone I know,” she wrote me in an email just before Christmas 2011 as I was preparing to visit my family in Arizona. “I really have to come visit you in Spain to see why it is you’re still there.” I promised to call her once she was out of surgery for some build-up in fluids around her lungs, an effect of her treatment. The following day, she passed away. Her mother sent me a text message that I read, hysterical, in the Philadelphia International Airport as I boarded a Madrid-bound plane. Attempts to organize a mini-Dance Marathon at my old school never materialized, but I donated part of my severance package to Dance Marathon in Kelsey’s name and joined the Iowa Bone Marrow Donors Network. As Hayley and I made preliminary plans for this summer, I contact the UIDM’s sponsorship and business directors, setting up a donation page and walking in memory of Kelsey and all of the other families coping. 2013 has really been my year, between a promotion, getting my European driver’s license and (fingers crossed) obtaining my master’s degree. Things may be coming up roses for me, but I realize that this year has been tough on many of my loved ones. That said, I want to raise awareness of the numerous Dance Marathons that are emotionally and financially supporting families afflicted with childhood cancer, as well as trying to raise $500 – 100% of which will go to the University of Iowa Dance Marathon. My pilgrim conch shell will be accompanied by the leis Kelsey and I wore during the Big Events we spent together, my name-tags from when I was on the leadership team, and lime green letters FTK – For the Kids. Please consider a tax-deductible donation to the University of Iowa Dance Marathon to keep Creating Tomorrow by Dancing Today, and follow me at #CaminoFTK on twitter and instagram. And many thanks to my sponsors, without whom this Camino would not be possible. Interested in helping me complete the Camino For the Kids? Please contact me for sponsorship opportunities or check out my Camino Pinterest board for inspiration! Cat, what a wonderful way to honor Kelsey and make your Camino about others. 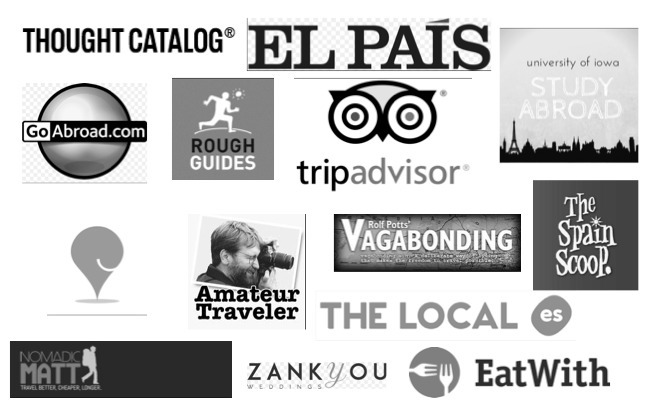 I am so excited for you and can’t wait to hear about your experience on one of the routes to Santiago less traveled. My heart is so touched by your generosity. Kelsey would have enjoyed following your progress during your journey and I know her Spirit will be with you every step of the way. Safe Travels and know that you take a piece of my heart with you. What a beautiful sign of friendship for Kelsey and other families! All the best to you on your walk and I’ll be with you in spirit and following your posts! You are walking in Love with a big heart and it will be awesome! Thank you all, everyone! I’m really looking forward to making the trek and helping along the way. It’s really the spirit of the Camino. Please keep sharing – I’m already 25% of the way towards my goal! What a beautiful post Cat. I hope you have a great walk. Can’t wait to hear all about it. Thanks, Lauren! Hoping to find some means to be able to blog with, but I’ll be updating on social media definitely. You can follow along on #CaminoFTK if you’d like! How can one donate to this amazing cause?! What a great cause to walk for. Good luck on your Camino! P.S. I was also a Dance Marathoner at BGSU in Ohio. Danced two years and couldn’t put my body through the torture another year so I joined the PR Team. Such awesome memories and to be able to make a difference! I plan on running several posts, including packing lists and preparation – I’m really excited about the Camino and have just signed on two important sponsors. Even when things are grim, people are willing to help in innumerable ways. Awesome to hear that you’re involved with DM, too! Buen Camino, Courtney! Hey Cat it’s great to see you’re going to do the camino, and for such a worthy cause. I’m also thinking about doing a week or so at the end of next month. Time will tell! A friend of mine did the Camino a few years back and I think he would say it changed his life. Great stuff, and good luck! What a great story Cat. Thanks for sharing your personal reasons behind deciding where to send your donations. You’ve convinced me! And good luck with the walk as well. what a powerful article. so glad (and proud) you’re walking the camino – and i love that you’re honoring kelsey in this way. good luck! A heartwarming–and heartbreaking–story. Best wishes on a successful pilgrimage. I’m sure Kelsey is there with you in spirit. It takes a lot of personal sacrifice to do something extra special – like you are – for someone else, I’m just sorry to read that in your case it was a friend. I wish you the best of luck every step of the way. Hey Dale, thanks so much for your kinds words. As volunteers yourself, you know how much it can to give, and how much you can get in return. Please keep reading about my trek and all that leads up to it! Very touching post. Kelsey will be with you every step of the way, especially on the tough days. All the best, Kathryn. Really appreciate your kind words, Kathryn! I may have several breakdowns, but I can only imagine how I’ll feel when I walk into the plaza and collapse in front of it from mental and physical exhaustion! Stay tuned! Walking the Camino sounds unforgettable and iconic, like riding the TransSiberian railroad all the way if you’re in Russia or climbing Ben Nevis annually if you’re in Scotland. Have a great walk! Here’s hoping! People it changes them, so I’m definitely in for a treat. What a fantastic idea to raise funds for a great cause and challenge yourself on every level. I’ve got a friend of mine getting ready to do the Camino as well…always good to see more about it. I know five people who have done it, and I still haven’t. Perhaps one day when we get over there Cris and I are hoping to get to Spain in early 2014, so it might have to be part of our agenda. Very touching story — best of luck! I shall follow your progress with great interest! I’ve been wanting to do this for years, but various things have stood in my way to date, so I will walk with you vicariously. It’s a wonderful thing you do, and I wish you loads of luck on every level. Things are very tight just now, but if I have a little left by the end of the month I’ll visit your site. I understand completely, Linda…and accept love by way of shares! Awareness is another big part of this, too. Look forward to the journey and to having you along in spirit! What a uniquely beautiful way to honor your friend and bring awareness to such a worthy cause. I wish you all the best on your journey. I know it will be remarkable and I look forward to following as you walk the Camino. Thanks, Gayla – I really appreciate it! We live 500m from the Northern Route and often encourage pilgrims as they wend their way to Ribadesella. I will follow your journey with interest… enjoy. 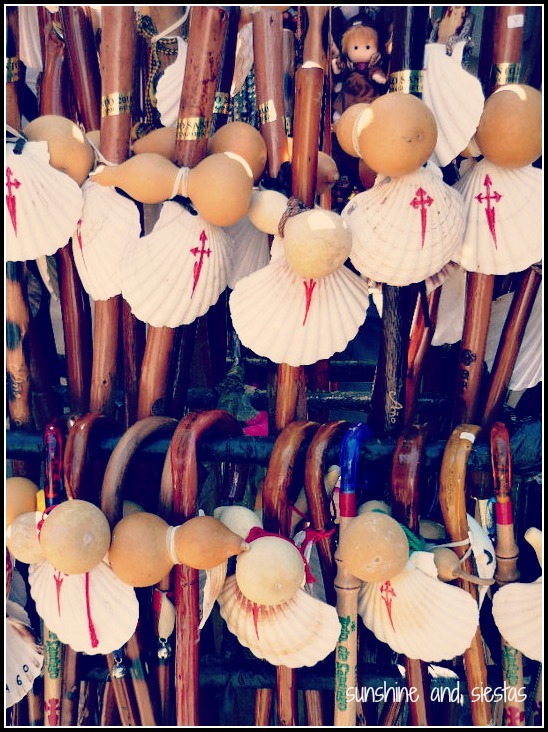 Ribadasella is lovely – I’m bummed that we can’t do more of Asturias, but have a feeling we’ll probably choose to walk again for Semana Santa. Use the #CaminoFTK hashtag to follow along! Hi Cat! I’m going to be heading across the pond on August 7th, with the goal of walking the Camino from Paris all the way to Santiago. I’m touched by your story and your particular purpose for walking–and it’s just another reminder about the amazing reasons for why people undertake the Camino. I wish you a buen camino and can’t wait to hear more about it! Awesome goal!! How long will that take you? Definitely stay in touch and let me know how it all goes! Suerte! You have a great motivation for your adventure. Thank you! Enjoy your own – have just added you to my new Feedly so I can follow along. My mom is brining my conch shell with her Friday when she flies out – it’s been on my night table back in Chicago for five years! We’re behind you Cat, look after yourself and keep putting one foot in front of the other.